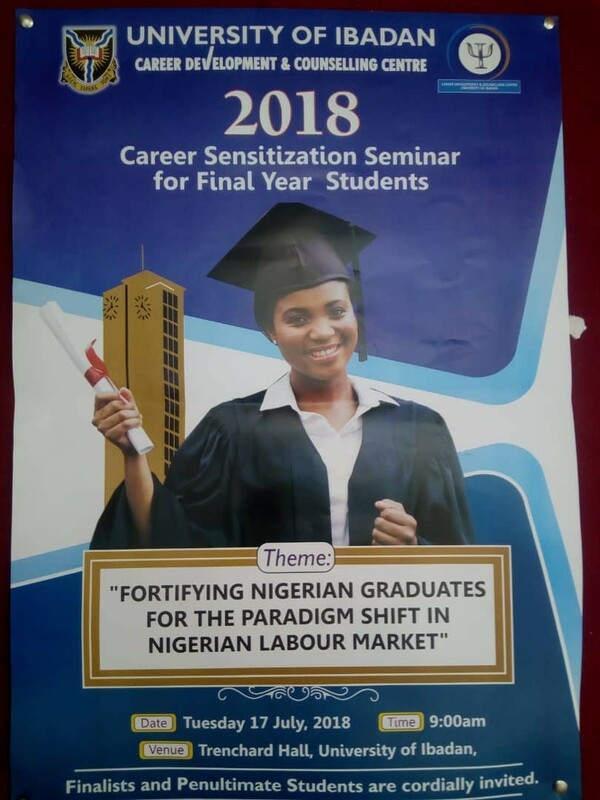 Themed, fortifying the Nigerian graduates for the paradigm shift in Nigerian labour market, the programme held at the University’s Trenchard Hall. The programme was a 4-stage sensitization session where students were taken through rudiments of entrepreneurial skill, career pursuit, recruitment trends and skills for employability. In his address on, “Entrepreneurship: a panacea to endless job search”, Professor S.A. Adedeji of the Department of Educational Management, University of Ibadan, he explained how students can get out of unemployment and make themselves marketable. He attributed some of the problems the labour market faces to the rarity of statistics and also the gap between what the university gives and what the labour market demands. He, therefore, called for the need for move to review the curriculum of Nigerian institutions “to meet global standard and current trend”. “Our curriculum as it is presently will not be able to deliver what the market is asking for; we need a curriculum review,” he simply clarified. While speaking on the “Current trend in recruitment drive”, Mr John Ikuemonisan, the HR Team Lead, Burgani Services, he discussed various tips on how to write a winning CV, appear before interview panel and the latest development in the world of job procurement. “In your own little way, ensure you have engaged in something either voluntary or as an intern,” he advised. Mr Adekunle Adekola, another speaker of the day, attributed horning of soft skills to Nigeria’s discovery of oil and her concentration on it. Speaking after the event, Salaudeen Abdurrosaq, a student in his final year in the Department of Statistics, expressed his joy to be part of the programme which availed him the opportunity “to know what is expected from a graduate” and “what life is after graduation”.